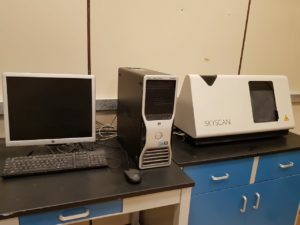 The Skyscan 1172, 50mm FOV (image field width) is a desktop ex vivo microCT specimen scanner. 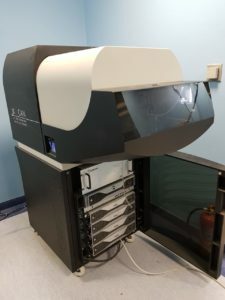 This instrument has a fully distortion-corrected 11Mp X-ray camera that is a 12-bit cooled CCD fiber-optically camera coupled to scintillator. The X-ray source is 20-100kV, 10W, with a <5µm spot size. The detail detectability is 1µm at highest resolution to 25µm. Importantly, the Skyscan 1172 has an innovative dynamically variable acquisition geometry that provides the shortest scan times possible at any magnification (adaptive geometry features explained more fully below). Cross-section images are generated in a wide range of formats up to 8000 x 8000 pixels. The maximum object size is 50mm in diameter or height. Reconstruction can be performed using either a single PC or using the cluster of 4-PCs in the core facility to enhance post-scan reconstruction times. 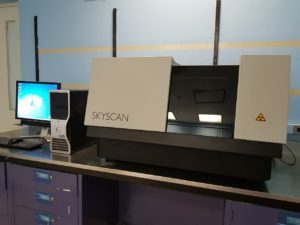 Importantly, the Skyscan 1172 has PC windows based software for 2D/3D image analysis, bone morphometry and realistic visualization, making it accessible for use on investigators’ home and laboratory computers. 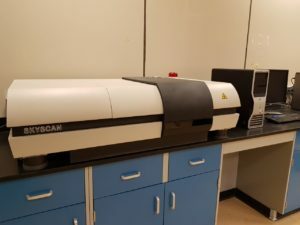 The SkyScan 1173 is a high energy micro-CT scanner for large and dense objects with spiral scan possibility. It includes a newly developed 130kV microfocus X-ray source with improved stability of the focal spot position, a large format (>5Mp) flat panel sensor with special protection by a lead-glass fiber-optic window for achieving a long lifetime under high energy X-rays, and a precision object manipulator for large (up to 140mm in diameter, 200mm in length) and heavy (several kilograms) objects with an integrated micro-positioning stage. The SKYSCAN 1176 is a high performance in vivo micro-CT scanner for preclinical research. Is equipped with an 11-megapixel X-Ray detector. Image field width can be up to 68 mm allowing full body mouse and rat scanning or distal limb scanning for larger animals, such as rabbits, at pixel sizes of 9, 18 and 35µm. Variable X-Ray acceleration voltage and filters provide scanning flexibility to allow imaging of a wide range of samples from lung tissue to bone with titanium implants. The full range of SKYSCAN software is supplied, including fast volumetric reconstruction, software for 2D / 3D quantitative analysis and for realistic 3D visualization.